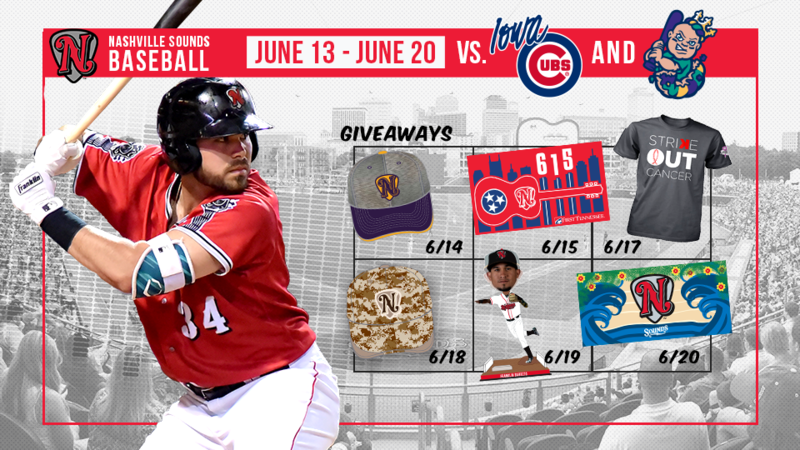 The Nashville Sounds Baseball Club is back in action at First Tennessee Park on Tuesday, June 13th when they welcome the Iowa Cubs - the Triple-A affiliate of the Chicago Cubs - for a four-game series. Following the Cubs series, the Sounds host the New Orleans Baby Cakes - the Triple-A affiliate of the Miami Marlins - for a four-day, five-game series from June 17-20. Tuesday, June 13 vs. Iowa - 7:05 p.m.
Tuesday Night Live - It's Country Night at First Tennessee Park. 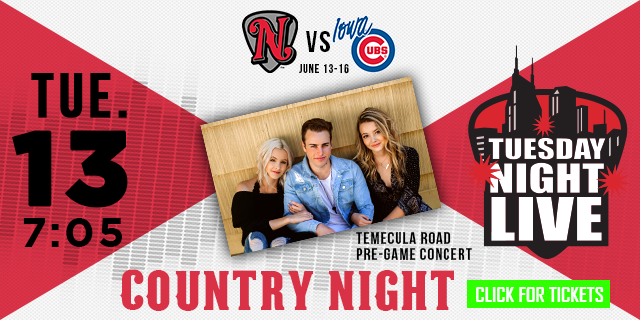 As part of Country Night, Universal Music Group country trio Temecula Road performs a pre-game concert at the guitar scoreboard plaza from 6:15-6:35. 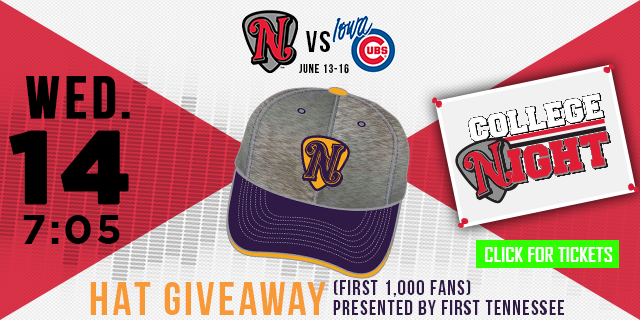 Wednesday, June 14 vs. Iowa - 7:05 p.m.
College Night - Lipscomb University/Nashville Sounds hat giveaway to the first 1,000 fans presented by First Tennessee. Seniors (60 and older) receive discounted Corner or Select tickets - subject to availability. 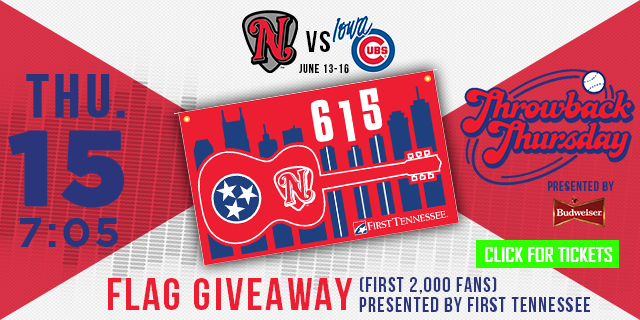 Thursday, June 15 vs. Iowa - 7:05 p.m.
615 Night presented by First Tennessee - Celebrate Nashville and the surrounding areas with a special 615 Flag Giveaway to the first 2,000 fans. Tennessee Titans first round draft picks Corey Davis and Adoree' Jackson will throw out the ceremonial first pitches. Throwback Thursday presented by Budweiser - the Sounds will wear throwback jerseys to commemorate the team's original uniform style from 1978. Fans can purchase Coca-Cola fountain soda and Budweiser draft beer specials for $2. 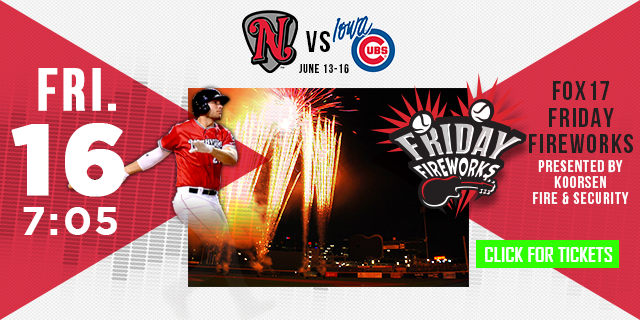 Friday, June 16 vs. Iowa - 7:05 p.m.
FOX17 post-game fireworks presented by Koorsen Fire & Security. Enjoy the fireworks with a custom pop music playlist. The LEGO Play Ball Tour is at First Tennessee Park and offers fans an interactive LEGO building experience perfect for families to enjoy before and during the game. 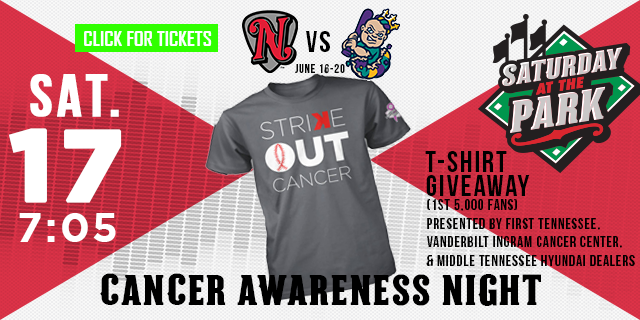 Saturday, June 17 vs. New Orleans - 7:05 p.m.
Cancer Awareness Night - The first 5,000 fans receive the "Strikeout Cancer" T-Shirt Giveaway. Additionally, the Sounds will sport special cancer awareness jerseys that will be auctioned during the game to benefit the American Cancer Society. 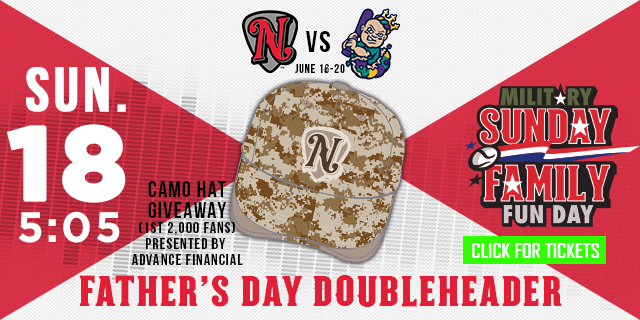 Sunday, June 18 vs. New Orleans - Doubleheader at 5:05 p.m. The Sounds and Baby Cakes will play a doubleheader which begins with the two teams resuming a suspended April 30th game in the fourth inning. The game will be a full nine-inning contest and will be followed by another seven-inning game beginning approximately 30 minutes after the conclusion of game one. Pre-game autograph session with select Sounds players from 4:05-4:20. In addition, the Sounds promo team will host the coloring station for children to color baseball posters and sign up for on-field games. Military Sunday presented by Piedmont Natural Gas and Tennessee 811- The Sounds extend their military appreciation with special military green jerseys and discounted Corner or General Admission tickets for active and veteran men, women and families - subject to availability. Post-Game Kids (ages 12 & under) Run the Bases with Dads as part of the MLB Play Ball Initiative. 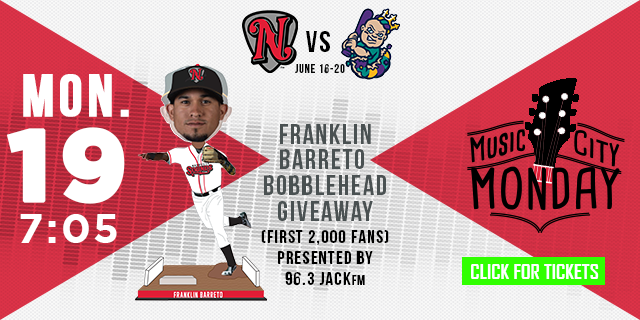 Monday, June 19 vs. New Orleans - 7:05 p.m.
Franklin Barreto Bobblehead Giveaway to the first 2,000 fans. Kroger Plus Monday - Buy a "Family 4-Pack" that includes 4 Select section tickets, 4 hot dogs & 4 fountain sodas for $44 when fans show their Kroger Plus card at the Sounds Ticket Office. The "Family 4-Pack" is available for advanced purchase only - subject to availability. 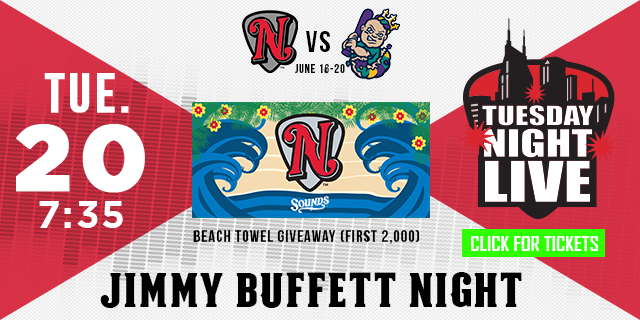 Tuesday, June 20 vs. New Orleans - 7:05 p.m.
Tuesday Night Live - Calling all parrot heads for Jimmy Buffett Theme Night as the first 2,000 fans receive a special Jimmy Buffett Beach Towel Giveaway. Additionally, a Steel Drum Band will perform pre-game and during the game. The Nashville Sounds have partnered with the following media outlets - Mondays: 96.3 JACKfm, Tuesdays: The Tennessean and NASH-FM 103.3, Wednesdays: 102.5 The Game, Thursdays: iHeartMedia, Fridays: FOX17, and Sundays: WSMV-TV Channel 4. The 2017 season is the Sounds' 40th in franchise history and their third as the Oakland Athletics' top affiliate. Season ticket memberships are available now by calling (615) 690-4487 or by visiting www.nashvillesounds.com.